One Simple Technique to End Your Procrastination | Mindshack: Shock Your Zen! Over the last few months during my semester break, I happened to land into a site that I never expect will change the way I will treat my academic life. Enter Study Hacks, arguably one of the most popular blogs about college life. The site is headed by Cal Newport, an MIT postdoc and author of two highly successful advice guides, How to Become a Straight-A Student, and How to Win at College. Most of his articles are centered around how to be a better student by doing less. What I liked about this site is that Cal Newport provides simple yet effective techniques on how to study. His posts range from effective study techniques to tried and tested time management systems, while his later posts are more centered on how to live an impressive life. His blog also lives by the philosophy of the Zen Valedictorian. The Zen Valedictorian, whom I aim to become, is the epitome of student productivity. He is widely accomplished in his major and extracurricular. He is the missing link between the grind, the slacker, and the failed grind. One usually thinks that being a grind and being a slacker do not mix, but the Zen Valedictorian proves otherwise. By being a Zen Valedictorian, one can earn straight A’s while spending late nights partying and doing other interesting activities. Read more on these articles to get a clearer view on what it takes to be a Zen Valedictorian. Okay, so what’s the technique? Anyway, by now you’ll be asking, what is this one simple technique that will end all our procrastination? In this article, Cal Newport states that most students use the to-do list when it comes to planning out their day. To-do lists may look effective, but on the contrary, they are actually not. In fact, according to Cal, to-do lists are dangerous. So what is a better alternative to this ineffective planner? Basically, the premise here is we shouldn’t use daily to-do lists. Instead, we should use time blocking. So, what exactly is time blocking? Before we talk about time blocking though, let us first know why a daily to-do list is not the ideal solution to our procrastination problems. 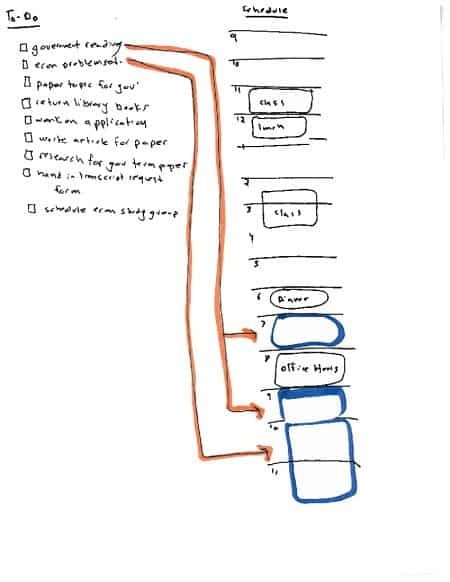 As Cal Newport notes in his article, daily to-do lists are a “terrible daily planning tool”. This is because daily to-do lists fail to incorporate two important things: (1) how long each task requires, and (2) how much and where your free time is available during the day. Without these two things, one is bound to be clueless as to how to tackle his tasks throughout the day. 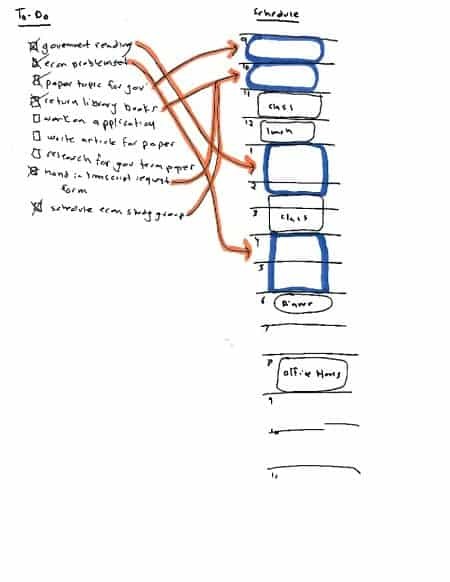 In the picture above, we can clearly see that without clear planning, one is bound to procrastinate until sometime later after dinner to do all of his tasks. He underestimates his tasks as he does not know how much and how long each tasks take. Usually, one finishes some of his tasks by midnight. However, he was not able to finish the others. Thus, the result is the typical bleary-eyed student pulling off all-nighters just to get his tasks done but to no avail. Starting from your schedule, you are more likely to take advantage of smaller chunks of time open earlier in the day. (Chunks you would have otherwise wasted). You are more likely to fit in urgent small tasks between the bigger time-consuming tasks. Over time, the technique will increase your ability to predict how much time work really requires — leading you to start things early enough to get them done without late night pain. In this picture, we notice how one makes use of the available time in the morning and afternoon. This leaves his evenings free of any looming tasks in his to-do lists. Hence, he needs not worry about missing his late-night parties. Since the start of this semester, I have been incorporating time blocking in how I tackle tasks. I make use of the Google Calendar to time-block certain parts of my free time to do my work. So far, I have been very effective. I complete most of my tasks in the morning. This leaves my afternoon and evenings void of any tasks on the list. As a result, I never spend late nights doing my assignments, minimizing the risk of getting too bleary-eyed. 🙂 Instead, I spend my nights surfing, doing Facebook, listening to music, reading blogs, etc., while others spend the whole night cramming their assignment, producing half-baked results. Another good thing here is flexibility. With the use of Google Calendar, I can easily switch the schedule of my time blocks in case there are some interruptions or anything. Through time blocking, I also know how long each task takes. I learned that I actually do most of my assignments in a span of 30 minutes to an hour, though I do these tasks chunk by chunk, hence the short time span. In addition, by working in the morning, I am able to focus better as my energy is highest in the morning. In addition, I get zero procrastination in applying time-blocking, because once I time-block my task on a specific time, I am bound to do that task once and for all. No delays, whatsoever. Credits to Cal Newport for giving this effective advice!